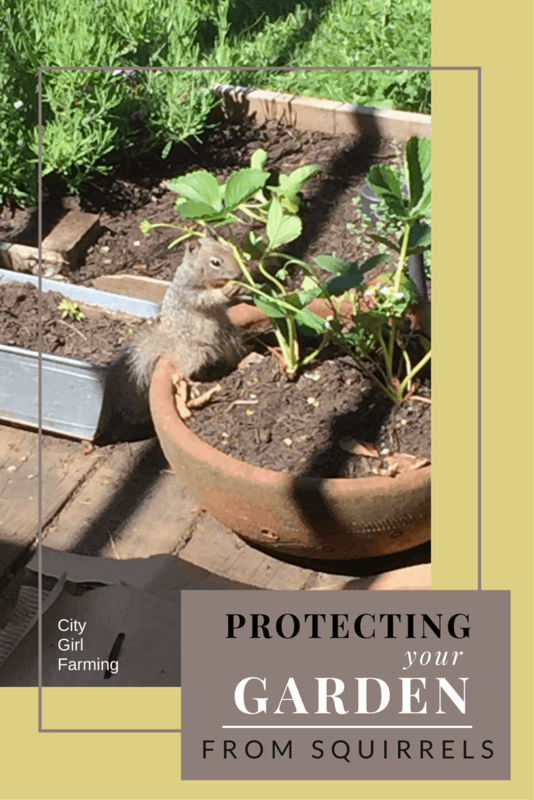 Do YOU Need to Protect Your Garden from Squirrels? I never cared about how to protect my garden from squirrels until this year. What happened? A mama ground squirrel decided to raise her family of three babies under my front deck. They were an adorable little family. Three half pint babies, wrestling like brothers across my tender carrot sprouts, chasing each other and running back to mama. I’d sit out on the deck and watch them. They were wary of me, but came pretty close if I didn’t make too much noise. So I tried to ignore the fact they were destroying all my hard work in the garden. It was maddening. After one day when they killed four sunflowers, dug up half a row of beets (biting off the tiny beet start and tossing the rest), harvested and shelled numerous peas, killed the nasturtiums in my planter box and pillaged the strawberries, I’d had enough. 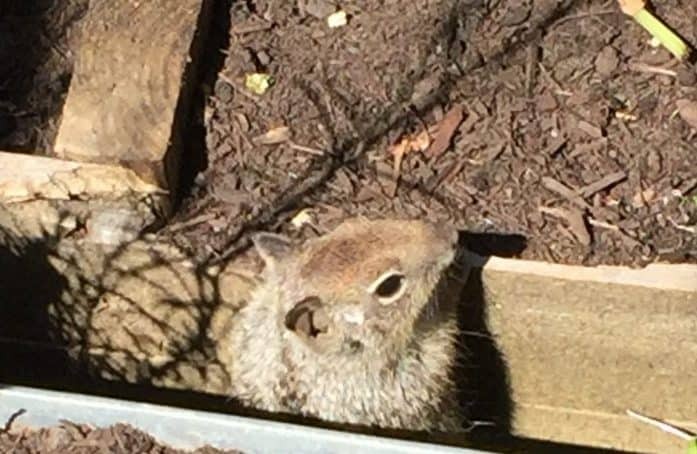 Besides feasting on and destroying garden spaces, these ground squirrels are known to cause structural damage to homes, as they burrow in the ground (in my case, they’re living under the deck). 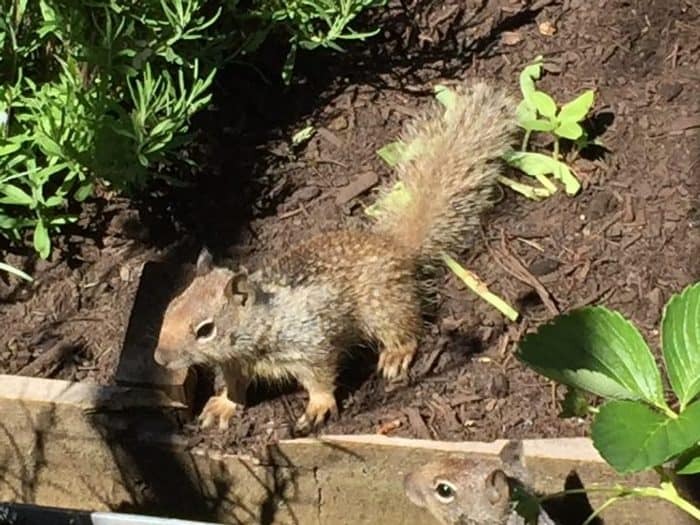 So, I researched how to discourage squirrels from hanging out in the garden and I found a number of ideas on how to get rid of these cute but pesky unwanted visitors. You can buy commercial urine to sprinkle around the garden areas. The squirrels smell it and stay away. I’m not sure how it smells for humans? Again, the idea is the release an odor than the squirrels don’t like. Apply this along the fence lines and pathways. You definitely need to check with your local laws to see if you can catch and relocate squirrels. If you can catch and relocate, make sure to take them at least five miles away, ten is even safer. Some say relocation is cruel because the squirrel survival rate is very low once they’re relocated. Because of this, use traps that kill. This option would be pretty hard if you have a big garden area (and would be pretty spendy). The fence should be made out of 1/2-inch hardware cloth or sheet metal. It needs to be buried in the ground at least 6 inches, and needs to be at least 18 inches high. If you live in an area where it’s okay to shoot, and that’s something you can do (I am way too wimpy for such things), killing is the way many swear by as the only sure-fire way to get rid of the problem. Most areas (again, check) don’t have any protective regulations for squirrels and you can kill them. 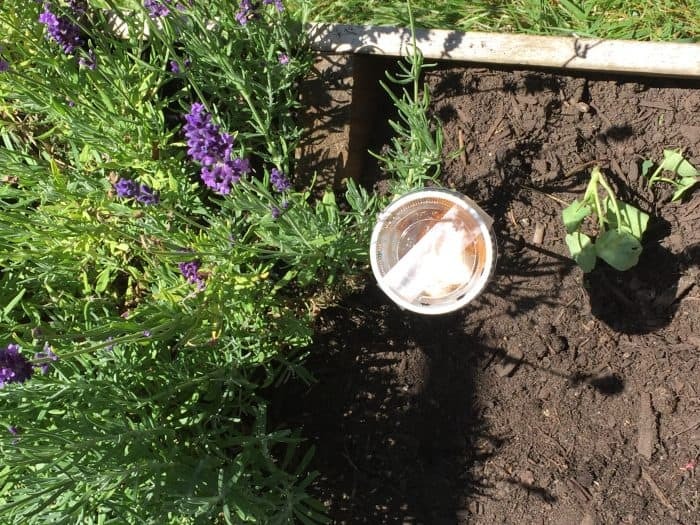 After some research, I decided to try this simple, non-toxic solution of placing cayenne pepper and peppermint essential oil plastic containers around the garden to discourage them from hanging out in those areas. I picked this option because I had all the stuff I needed to make this project. 1. 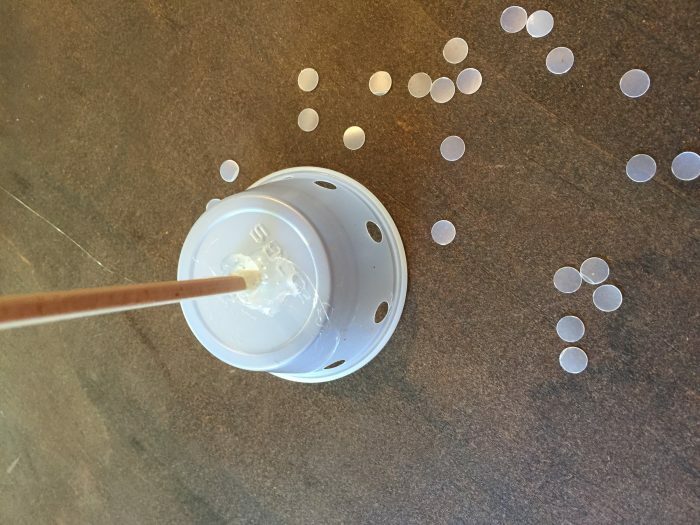 First, take the paper hole punch and punch holes all around the plastic contains along the top third of the container. 2. 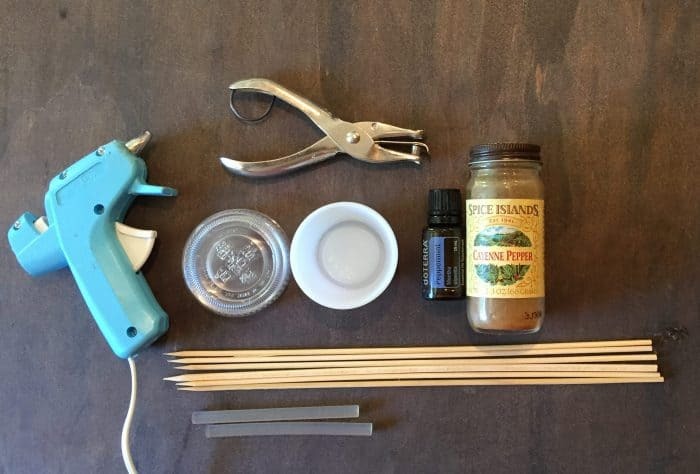 Using the hot glue gun, glue a skewer to the bottom of each container (you’ll have to hold it for a couple minutes until the glue cools and hardens). 3. 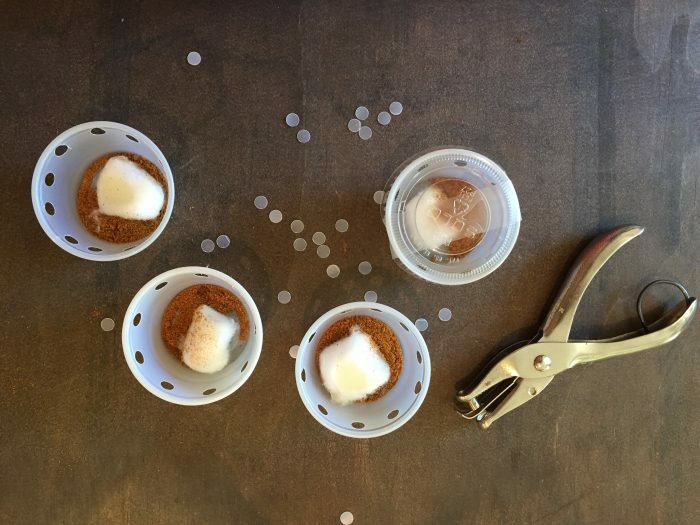 Drop several drops of peppermint oil on a cotton ball and place inside container. 4. Add a teaspoon to tablespoon of cayenne pepper to container. 5. Secure the lid onto container and then tape it down with some tape for added reinforcement. 6. Stick the containers in the ground with the skewers throughout the garden. The theory is the scent will repel the squirrels. This is round one. I will move on to other ideas if this one doesn’t pan out. And I’ll keep you updated of the progress. Which trick will you use to protect your garden from squirrels?